This weapon was used on the Colorados. It was designed in great secrecy as "Type Gun, 45 calibres" and first test fired in August 1914. 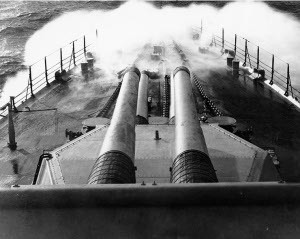 The Bureau of Ordnance was proud of its design, believing the only rival was the German 15"/45 gun and claiming that the U.S. gun "far exceeds it in power and energy per ton of gun. The Bureau believes our gun to be the most powerful in existence" (quoted by Friedman 1985). However, the other major naval powers had been doing their own highly secret development of new weapons, and the Japanese tested a comparable 16" weapon at about the same time and put it in service slightly sooner.